After what seems like a winter that lasted forever, Spring is finally in the air! It is a time of new beginnings and starting fresh, but it is also a time of holiday tradition. Both Passover and Easter arrive with Spring, and this year, they even fall on the same weekend. The AppStore is full of apps with holiday themes, some are just holiday versions of popular games, and others truly focus on holiday concepts. There are games, colouring books, and educational apps as well. Below we’ve compiled a list that provides a good variety of activities with something for everyone in the house. This app, by developer Jan Essig who brought us the Playground series of apps, has been recently updated to include an Easter theme. As in the Playground apps, the graphics are clear and cute and encourage the development of basic cognitive skills in a fun and engaging way. 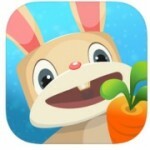 The app includes four mini-games: tic-tac-toe, seek and find, whack-a-mole, and a “Bunny Says” an auditory memory game. The tic-tac-toe game can be played against the device or against a friend. 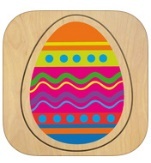 This is a beautiful wood puzzle app with an Easter theme. There are 15 different puzzles of varying difficulties. Besides the bright colorful design, there are also some nice options in settings to allow for adaptation for a variety of abilities. You can shut off the need to rotate pieces, and there is an auto mode in which the puzzle is animated and puts itself together. This can be useful for children with motor planning issues that often need to see how something is done first before trying it themselves. A popular Easter activity among young and old is decorating Easter eggs. There are many different egg decorating kits on the market and every family has their own traditional family favorite. A search of the App Store revealed many egg decorating coloring books. 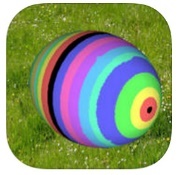 Egg a Sketch offers an egg decorator with a twist: you can view your egg in 3D, turning it to color all sides. There are a variety of colours to choose from and the drawing tools are simple to choose and use, making this a nice option for a variety of abilities. You can spin the egg as you color to create beautiful designs or hold the egg still to draw your own. To save your egg simply take a screenshot. Here is another fun creative app from the ClickySticky series allowing users to create funny Easter bunnies, decorate Easter eggs and fill Easter baskets with all kinds of goodies. Stickers can be resized and rotated, repositioned and removed. Finished creations can be saved to the camera roll or emailed to others. With five different scenes and countless stickers the options are endless. Recently released and currently a top recommended app on the App Store, this bunny-themed puzzle app for older children (and adults) is sure to entertain for hours and encourage visual spatial problem solving skills. Players work their way through 600 different puzzles, helping the bunnies munch a path through Farmer Lester’s vegetable patch eating as many vegetables as they can. An interactive storybook describing the exodus of the Israelites out of Egypt. The app is in English but there is an option to record in your own voice which can be helpful for those who speak other languages, but can also be a nice family activity of reading together, and the child can record the story in his own voice. The app also comes with coloring pages, puzzles, and a memory game, all related to the story’s theme. It is also available for Android. This interactive app also relates the story of the exodus from Egypt, but is available in Hebrew as well as English. There is a lite and full version. One of the most important mitzvot on Passover is to retell the Passover story. The highlight of course being the reading of the Haggada during the Seder, the ceremonial meal that takes place on the first two nights of the holiday. In anticipation of the holiday, Beit Issie Shapiro has prepared a simplified Haggada, in Hebrew, on the TinyTap platform, so that children of all abilities can participate in the ceremony. It also incorporates symbolstix, for users of AAC. There are many Haggada apps on the AppStore, both in English and in Hebrew. One beautiful one that we found has been created by the organization Yeladim: Fair Chance for Children. It incorporates art by Israeli illustrator, Hanoch Piven, that he produced together with children at risk that the organization services. It is available only in Hebrew but children will enjoy the whimsical images. You can find the link here. As a bonus we are also providing links to two other Passover games that Beit Issie Shapiro has created on TinyTap, also in Hebrew. You can access the games by typing “Beit Issie Shapiro” in the Search field on Tiny Tap, or through the links provided below. This game focuses on the Passover song, Who Knows One? It also incorporates symbolstix and helps to reinforce number recognition through this very popular holiday song. This wonderful seek-and-find game was created by one of the teachers at the Beit Issie Shapiro Special Education School. Help Haggai find the Afikoman so he can get his surprise. When looking for apps to review vocabulary or concepts related to a particular subject, Bitsboard and TinyTap are always great options. Both of these apps have extensive libraries of ready made educational games. A simple search will likely reveal a large choice of holiday-themed activities. And don’t forget about the camera! Take lots of holiday photos and create family albums using TinyTap or another digital album app. 1) Take screenshots of the various menus, then enlarge, print, and cut them out, as appropriate, to allow for easier choice making. 2) If your child is able to use switch scanning and external switches then you can turn on those features in the iPad settings and allow them to choose their options themselves. 3) If your child uses a communication device with voice output make sure to add appropriate phrases or even links to songs so they can participate in the voice recording options as well. 4) For children that use switches, allow them to take family photos by turning on switch control in iPad settings. 5) Use a mount or stand that keeps the camera lens clear to give the child even more independence if they can’t hold the iPad themselves. We hope you enjoy our holiday apps! Let us know if you find other apps that your kids love.